Welcome to the latest episode of The Simply Smart Business Show. 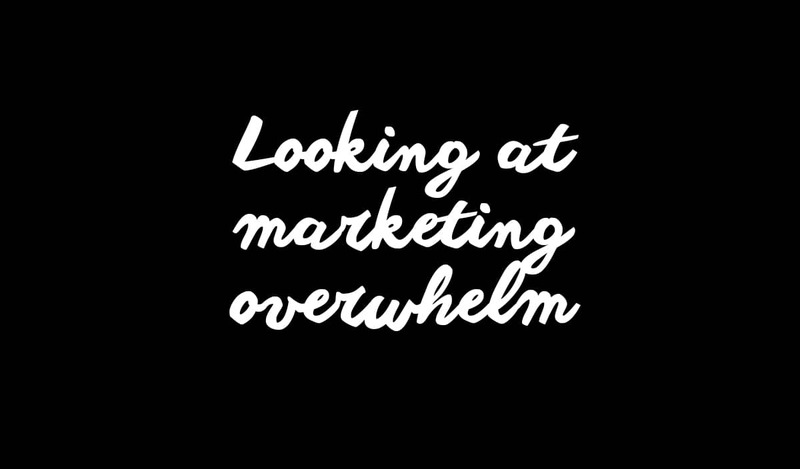 In this show I’ll be talking about the beast that is marketing overwhelm. We’ll also explore how you can be successful without having to do it all (for real!). There are so many exciting and varied marketing activities you can plug into your business in order to promote it. The options are seemingly endless. But what I hear time and again is that the sheer quantity of those different options make the whole thing seem utterly overwhelming. Here’s the thing – you don’t have to do everything to be successful. I know, I’m going against the grain here (especially since I’m always banging on about list-building, and social media, and funnels, and advertising, and…). Until you have a team around you that take some pressure off your back, you can’t explore every single marketing activity out there. There are simply not enough hours in the day. The key is picking one or two that will REALLY work for YOU. Here are a few examples of marketing activities that you can plug into your business, no matter how new (or experienced) you are. Some essential, some not so. Remember, you don’t have to do them all. Now this one is essential, because it provides the foundation for all your other activities. Start out by establishing a really clear content plan – it makes it so much easier. Also think about your core topics – the things you’re an expert in or the things you want to stand for, as well as the format you’d like your content to take. Blogging is a really simple way to get started (and a great way to show your expertise), but you could also live stream, or podcast, or create big juicy lead magnets. Just think about what’s right for you, because you need to be doing this consistently, no matter where you are in business. Note I said consistently, not daily. Pick a frequency that’s comfortable for you and stick to it. Your website is that place you’ll sell your thing, but it’s not going to sell that thing for you. I see a lot of new business owners getting really hung up on the perfect website, and the perfect logo, but actually you don’t need any of that at the beginning. Start out with a simple one-page site and make your own logo – there are so many apps now to help you with that. Simply put your name in a beautiful font and a beautiful colour. SEO is super important. A non-optimised website is like having a lovely little shop, selling all your lovely things, but without any roads or paths to get there. Having said that, SEO should be a priority later on in business, you don’t need to be thinking about it straight away. Start growing your list as early as possible. This isn’t another source of pressure and overwhelm for you, but it is important. Start out with a really affordable piece of software like MailChimp, ConvertKit or Active Campaign. If you have no budget, start with MailChimp, it’s free. But then once you want to explore automations and nurture sequences, you’ll want to move on to one of the other (still affordable) options. Automated nurture sequences can bring you really big results, but you don’t need to focus on them right at the beginning. A simple way to start growing your list is to create a beautiful lead magnet – think about your client’s struggles and put together something that will help them out. You can use a (free) tool like Canva to design a nice PDF, and then use it as a sign-up incentive. It’s tempting to have a profile on every platform, but that can spread you pretty thinly. I advise picking one or two platforms that you enjoy, and that has the people you’re looking to connect with (you may need to do a bit of research to figure that out). Once you’ve picked your channels, show up there, every single day. Set some time in your diary. It can be as little as half an hour a day. Go and share useful content; find people asking questions about your specialities and answer them; connect with peers and influencers. Once you’ve nailed your approach, you might think about outsourcing and adding something else to the mix, it all depends what you want to achieve from social. Proactive marketing is a brilliant way to spread the word when you’re just starting out. Create a target list of all the people you know who have shown an interest in you, anyone you’ve worked with in the past, anyone you’ve collaborated with, or connected with online… then just approach them. Put yourself out there, introduce your new business. Tell them what you’re doing, and what you could do for them. You need to put that time into selling yourself. Obviously there’s more. Social media advertising can bring great results for a relatively low spend. Google AdWords works really well. Affiliate marketing and joint ventures can have a huge impact. PR. Print advertising. There’s a whole bunch. But my aim here is NOT to add to your marketing overwhelm. Try things, test things, play around and figure out what you actually enjoy. Don’t force yourself to do something you hate – your audience will pick up on that. Once you really nail a particular activity, you can always add another to the mix, just remember you’re in it for the long haul, you don’t have to do everything now. Tara Newman, a coach I’ve worked with and adore greatly, sums it up perfectly: Do less, but better.